One of the staples of our business is repairing damaged or decayed house trim. Excess moisture, bees, woodpeckers, termites and inadequate maintenance are some of the more common issues that lead to damaged house trim. While there are many material options available and no one product is the best for every circumstance, PVC trim comes close. I always consult with my clients about the best options for repairing their home, and once they learn of the many benefits provided by using trim made of PVC they often choose it as the best solution for their home repair. 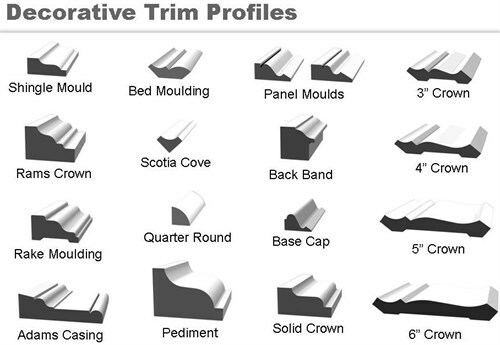 PVC trim is available in a wide selection of sizes and profiles. Standard sized boards from 1×4 up to 1×12 blend seamlessly with existing wood or composite trim such as fascia boards, rake boards or beam boxing. Larger panels whether decorative or functional can be fabricated using PVC trim sheet which is manufactured in thicknesses ranging from 1/4 inch up to a full inch. At four feet wide and up to ten feet in length, PVC trim sheet is suitable wherever large panels are required. One area that is especially well served by using PVC trim and sheet stock together is foundation access doors. Foundation or Crawl space access doors built from PVC trim not only look great but have exceptional resistance to insects and decay. Unlike foundation access doors made of wood PVC doors require little maintenance and are not subject to damage from insects nor will they rot even when in direct contact with the ground. 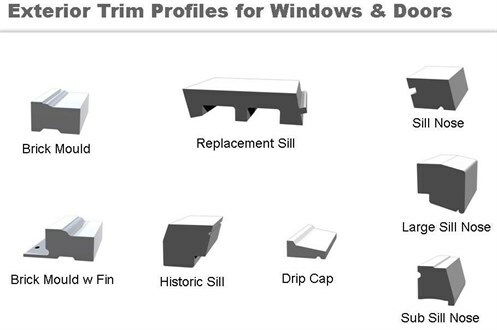 Brick mould, bed mould, shingle mould, rake mould, drip cap, window sill and sill nosing are just a few of the many other profiles available. 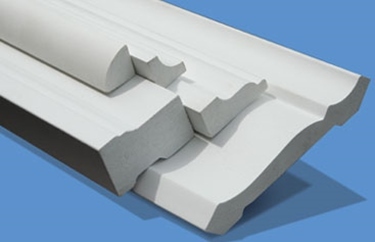 PVC trim is extruded from composite cellular foam making it smooth and uniform. It has a similar weight and feel of wood and can be sawed, drilled and fastened like wood. Unlike wood it is impervious to water infiltration, insect damage and decay. It is also UV stabilized to prevent break down by sunlight. It readily accepts paint but painting is not required to protect it from the elements. Repairs made using PVC trim can easily last twenty five years or more with minimal maintenance. While it is considerably more expensive than wood, PVC trim still provides excellent value. The extra up front cost is more than offset by the durability of the repair. PVC trim requires less maintenance than wood trim and even with minimal maintenance it lasts for decades and unlike wood trim it remains in pristine condition long after the repair is completed. Because it is a very stable product it never flakes, chips, splits or cracks like wood often does as it ages. This entry was posted in Exterior Maintenance and tagged Brick molding, damaged wood, maintenance, PVC Trim, PVC trim boards. Bookmark the permalink. I never realized how high quality pvc is. I was originally just going to stick with regular wood, but you can get quite a bit of life out of the pvc. Thank you for sharing, this should make future projects a lot better and easier!